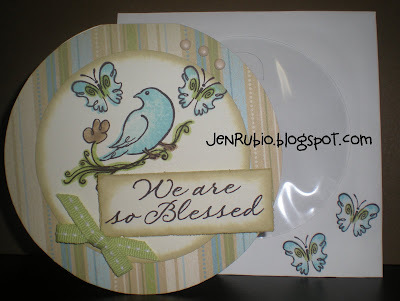 "Blessed" Stamp of the Month blog hop! 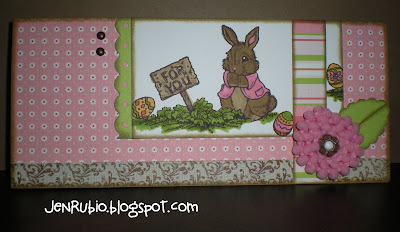 Welcome to our April Stamp of the Month blog hop featuring this month's new SOTM - Blessed D1455! 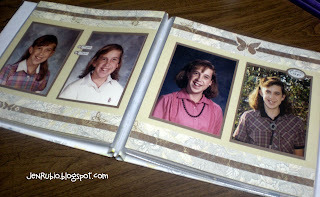 If you've just joined me from Haley's blog then you are on the right path! 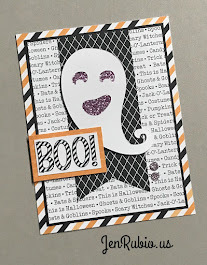 One of the most fun things about this stamp set is that you get solid image stamps that you can stamp inside the outline images to add a pop of color inside the outlines (and save some time coloring in with markers). With our clear stamps it's easy to see exactly where to line them up so you can stamp one image perfectly inside another image each and every time (you can't do that so easily with wood stamps)! 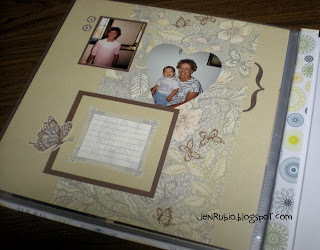 I used 2nd generation stamp-rolling technique with the solid images to achieve the shaded look I have on my flower, bird, and butterflies below. Then I colored the stems and leaves with a Sweet Leaf marker and even added a little bit of green to the swirl inside the butterfly wings as well. 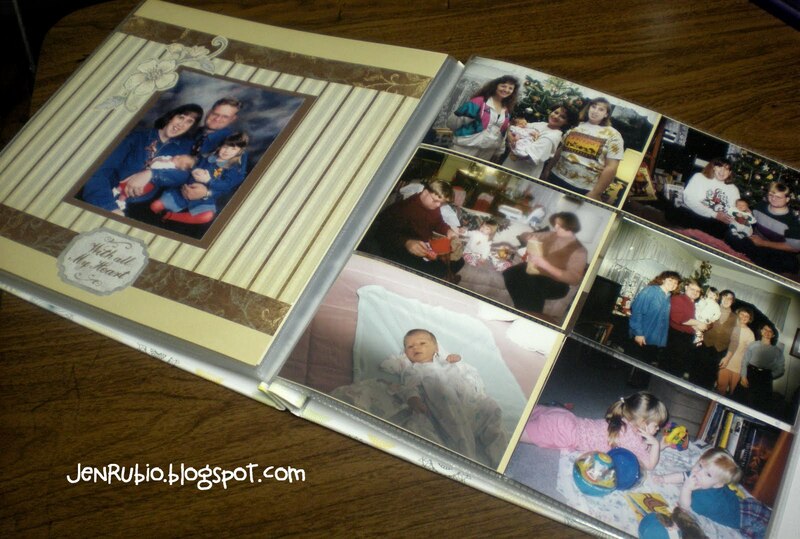 The 8x3.5 card design (above) is inspired by Wishes - Right Design (p. 42) and features the Miracle papers (X7133B). I absolutely LOVE our new 1" wide Sweet Leaf Stitched Grosgrain ribbon (Z1383), so I just couldn't resist adding that wide bow (wide ribbon is very in-trend right now)! 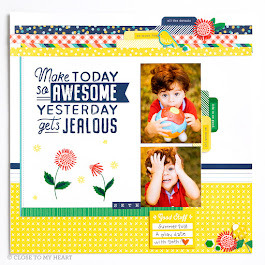 Finally, this 4.5" circle card (above) is inspired by Wishes - Simple Statement (p. 11) and it also features our Miracle papers (X7133B). 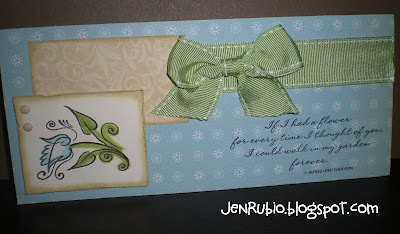 Peeking out from behind the card is a white cd sleeve envelope that I stamped to match and put the card in when I give it away. When the card is inside the envelope, the center of it will peek through the clear window in front - too fun! 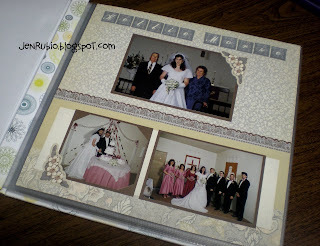 I also used our paper edge distresser (Z1297) to scrape and rough up the edges of the colonial white cardstock that is then sponged with bamboo ink and a sponge dauber. For just $2.50, our little edge distresser tool is an easy and affordable way to add even more interesting details to our creations! You can click on my photos for a more close-up view of this distressing if you'd like. 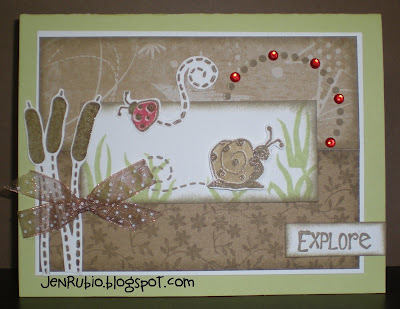 Now you can continue on the SOTM blog hop and see many other creative ideas for using this stamp set by visiting Kristie's blog next! Enjoy!! 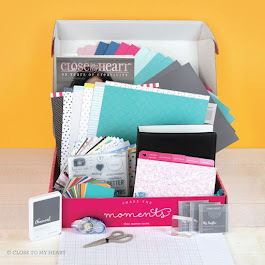 $5 Creative Class projects for 4/2! Here's a sneak peek at what we're making at my $5 Creative Class coming up this Saturday evening April 2nd (starting at 6pm and/or 7pm)! It's only $5 per person to attend and learn how to create one of each of these 3 projects with me (or make two of each item for $10 - still such a deal)! I have 12 spots open for this class but I expect it to fill quickly now that I have shared what we're creating, so please RSVP ASAP! You will need to bring your own adhesive (or IF this is your first time attending I will provide adhesive for you). For further details you can click here to visit my myctmh website calendar for more information! This nugget box (filled with hershey's chocolate nuggets) features the Mayberry papers (X7136B) and Tag the Occasion stamp set (B1362). 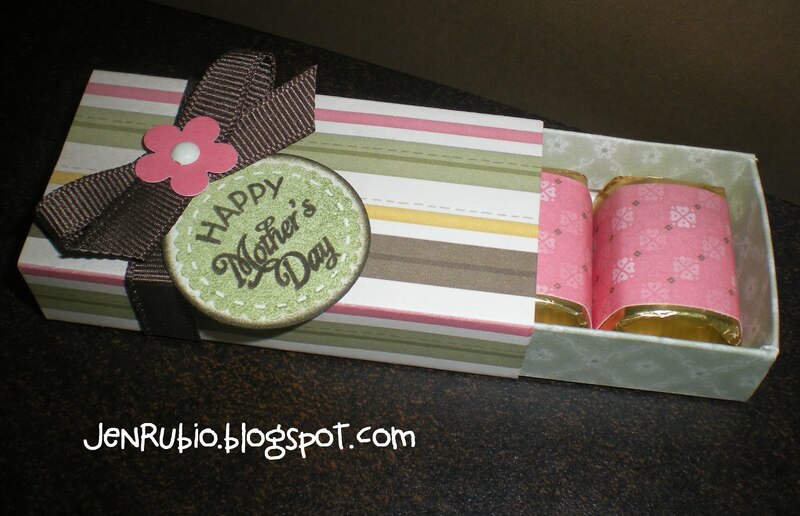 This stamp set includes a variety of sentiments to choose from so you can make this box for Mother's Day as shown here or for any other occasion you may wish to use it for! 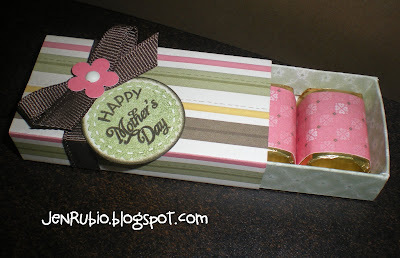 An instructional tutorial including the cutting/scoring measurements to create this nugget box can be found online here at Splitcoast Stampers. 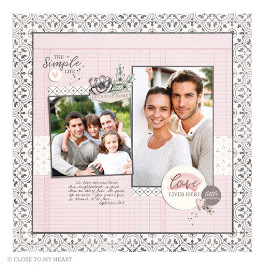 This standard size card features the Bliss papers (X7132B) and Miracle papers (X7133B). 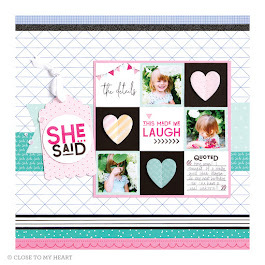 The stamped sentiment comes from the March Stamp of the Month - Sensational Season (D1454) and the heart stamp comes from the Miracle WOTG stamp set (exclusive b-size set only available with the G1023 Miracle WOTG kit). 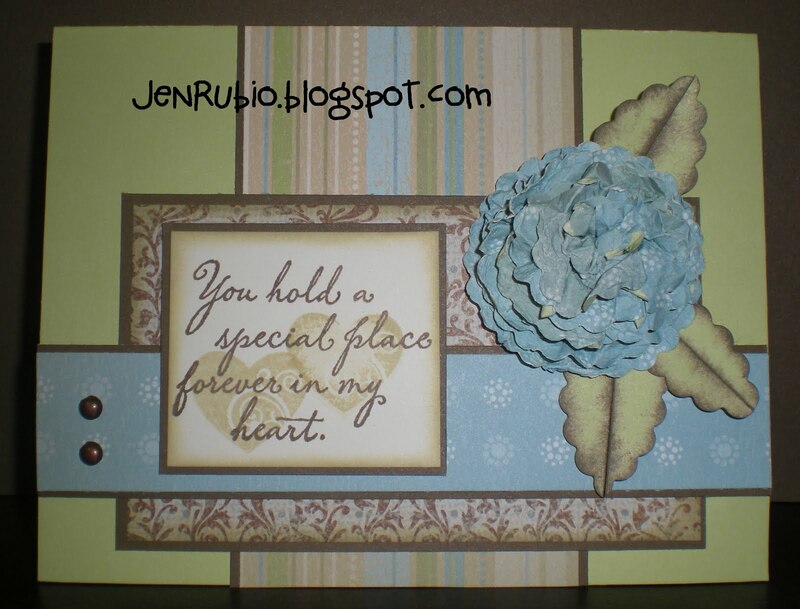 I will teach you at our 4/2 Creative Class how to make this fun dimensional paper carnation with leaves using our new 2" scallop circle punch and spray pen! This 4.5" circle card with coordinating stamped cd sleeve envelope uses the Miracle papers (X7133B) and features our April Stamp of the Month - Blessed (D1455). 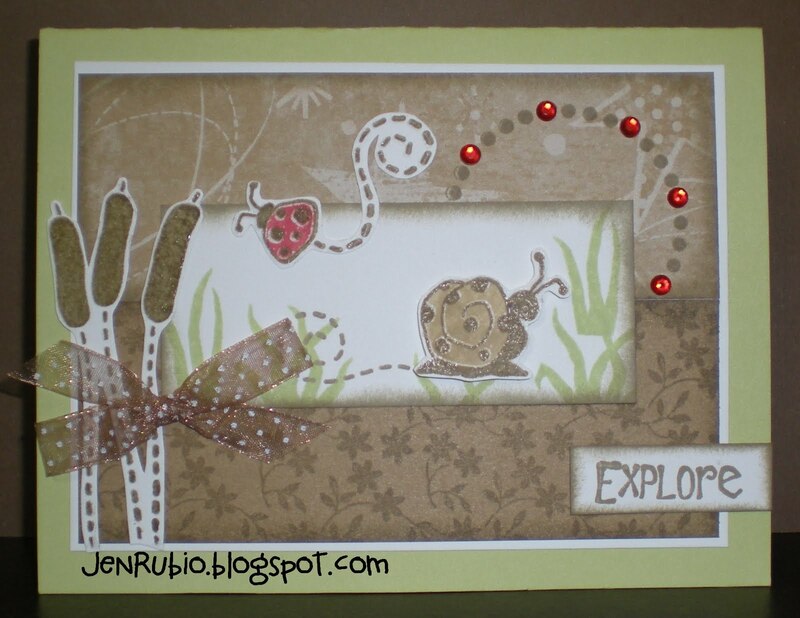 As we create this card together you will learn the stamp-rolling technique, coloring with markers, as well as how to use our paper edge distresser tool (Z1297). 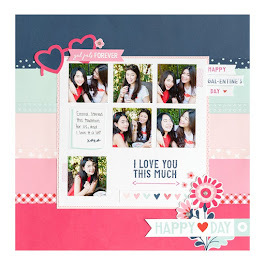 Easy online scrapbooking with Studio J!! Hello creative Friends! 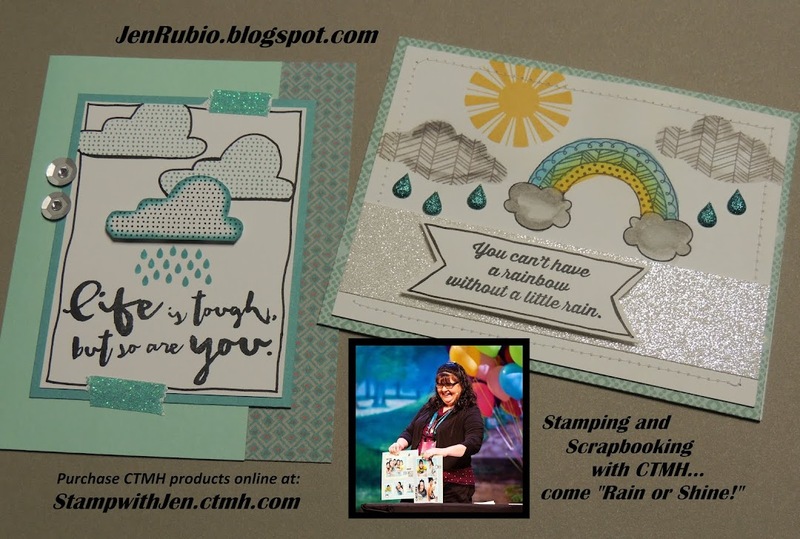 Today I am excited to share this totally AWESOME YouTube video made by one of my fellow CTMH consultant friends - Tresa Black, the fabulously artsy "Stamp Goddess!" 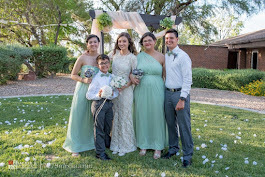 Her story just touched my heart so much that I couldn't wait to share it with you all here on my blog (and be sure to have some tissues on hand when you watch this, lol). 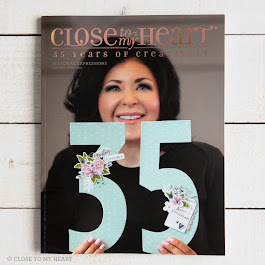 I feel so inspired by the sweet story Tresa shares in her video and it reminds me once again why I LOVE CTMH so very much! Studio J really can help you get more of your scrapbooking done faster, simpler, and easier! 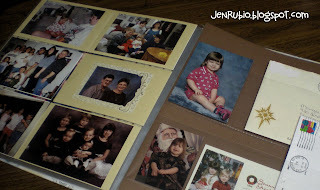 Studio J is not meant to be a replacement for the classic scrapbooking we so enjoy (you all know I could never give that up! 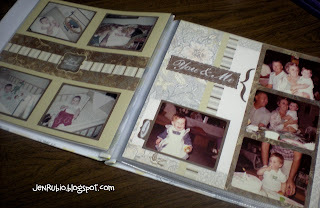 ), but rather it is just one more easy and fun way to help us get even more scrapbooking done. 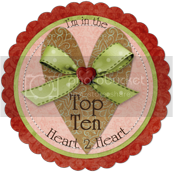 By the way, this video came about because Close To My Heart is currently having a video contest for consultants. 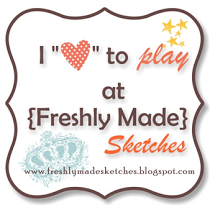 We have been challenged to create a video sharing the reasons "why" we love Studio J. The YouTube submissions with the most views will receive up to $300 in new product from CTMH. So, not only do you just HAVE to see this wonderful video clip, when you watch this video you are also supporting Tresa in her endeavor to win - go Tresa - yaaaaay! Watching this clip will only take 2.5 minutes of your time, and I know you will enjoy its heartwarming message and want to give Studio J a try. Enjoy the show (and if you're as inspired by it as I am, you may want to watch it more than once)!! Hope for Japan (available now)! The earthquake and tsunami in Japan caused untold devastation and heartache. Like so many of you, we’re eager to help. Help us raise money for the American Red Cross Japan Earthquake and Pacific Tsunami fund by purchasing the "Hope for Japan" stamp set. 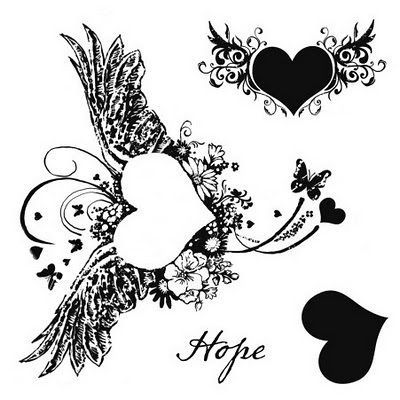 From now until April 30th, you can purchase the exclusive, non-commissionable “Hope for Japan” A-size stamp set for the special price of only $5 (retail value $7.95), and Close To My Heart will donate 100% of the profits to the American Red Cross efforts in Japan. 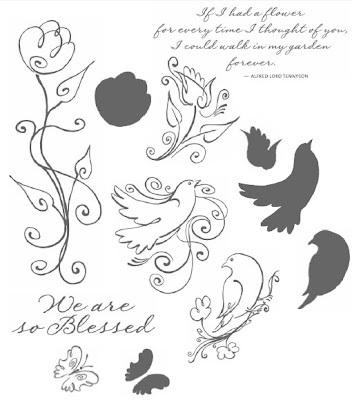 This beautifully designed stamp set reminds us of how our hearts are hopeful for those who are in need. My next order is going in late Saturday night (3/26) so if you'd like me to add on one of these stamp sets for you, just let me know right away OR add it on to your next order (online or in person) anytime before April 30th. Thank you for supporting this important cause with me! more quickly and simply and that is okay too! while still allowing each page to be different. to give to her - what a special gift! 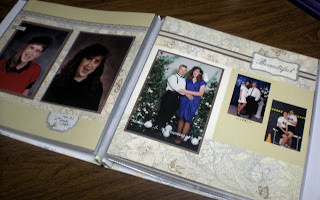 The page on the right includes a paper pocket I added to the page. Three tall Christmas Card photos are slipped behind the pocket (so that's why you only see half of the photos on the top half of the page). 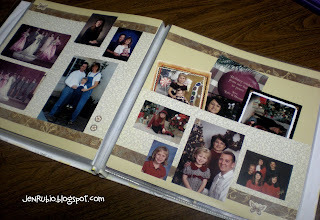 six horizontal pockets to hold 4x6" photos (item# 4113). still be pulled out and opened to be read. 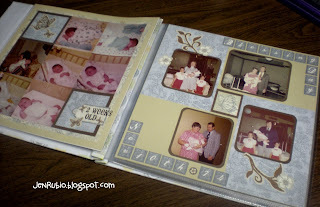 Finally, I want to wish Margie and Kellie much joy as they and enjoy their album together! Thank you for allowing me to share these pages here and for the opportunity to have a glimpse into your special relationship and many years of happy memories. I feel so lucky to get to know you in this way! 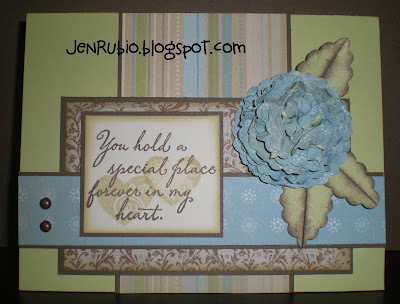 Ambiance card for H2H "Times 3" scene challenge! 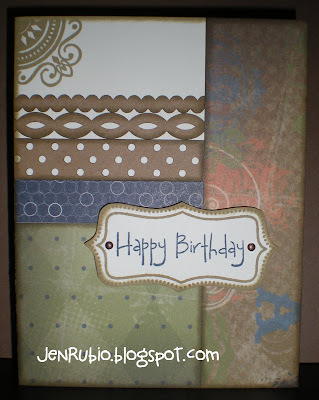 This standard size card is inspired by Originals - Center Charms (p. 59). 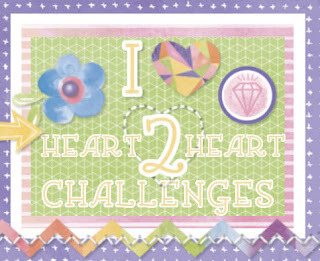 I created it using 3 different stamp sets to create a scene for the Heart 2 Heart "Times 3" challenge. 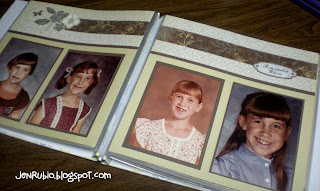 Stamp sets used include Ambiance C1349 (Idea Book p. 50), Connections D1330 (Idea Book p. 95), and Intrinsic Backgrounds D1335 (recently retired). 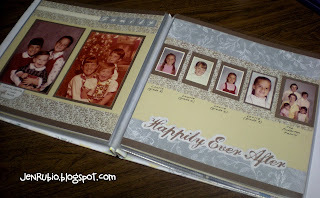 Colors used include Bamboo, Chocolate, Colonial White, Desert Sand, Sweet Leaf, and just a touch of Cranberry (including Red sparkles from Z1326). (aren't you glad it's coming soon?)!! $5 Creative Class moved to 3/12 at 1pm or 2pm! 1). A standard size masculine birthday card featuring the Lucky papers and our NEW Kraft Color-ready Borders (Z1377 shown on page 120). 2). 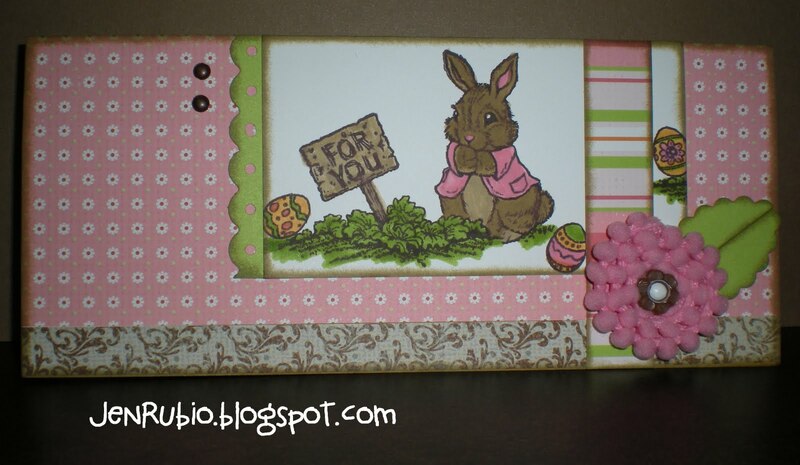 An 8x3.5" card for Spring/Easter featuring the March Stamp of the Month - Sensational Season D1454 with the Sophia and Bliss papers. 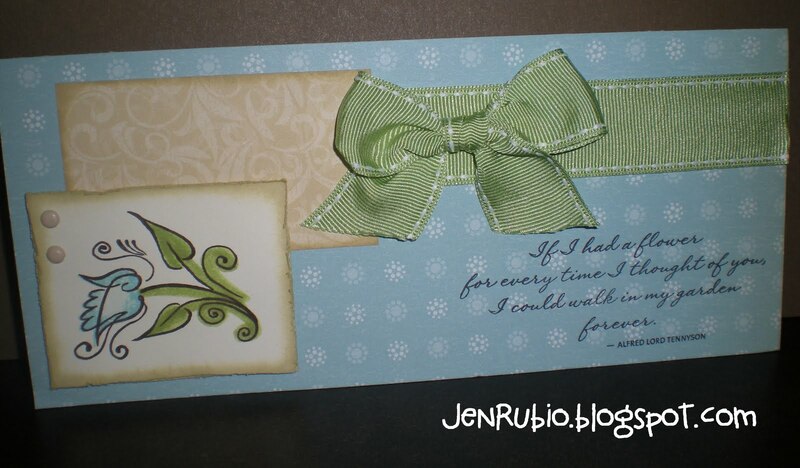 I will teach you some tips and techniques for coloring with markers and how to create a flower with pom-pom ribbon from our Pink Collection Designer Ribbon (Z1384 shown on page 115). 3). 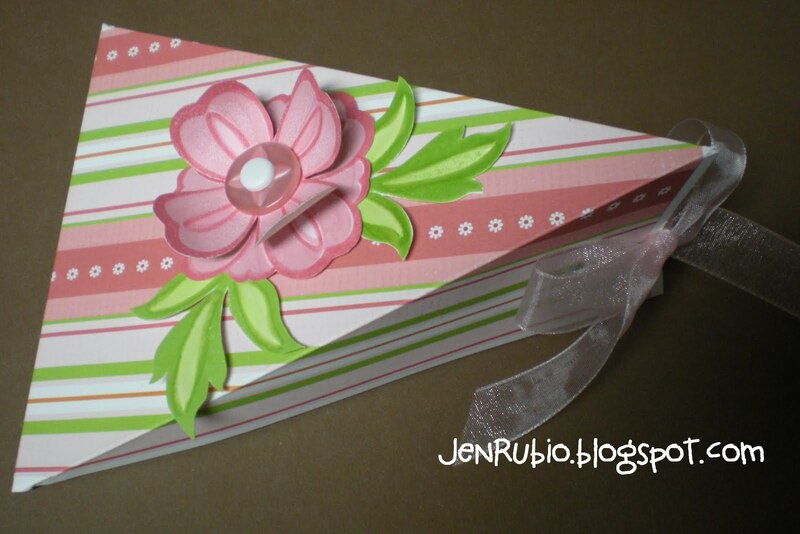 A pretty triangle-shaped gift box using the Sophia papers - embellished with a 3-D flower we will make with the Heartfelt Treasures stamp set (C1456 shown on page 9).